People with plantar fasciitis often describe the pain as worse when they get up in the morning or after they’ve been sitting for long periods of time. 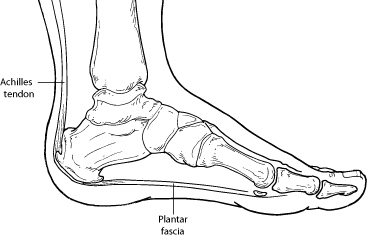 After a few minutes of walking the pain decreases, because walking stretches the fascia. For some people the pain subsides but returns after spending long periods of time on their feet. • Ice. Putting an ice pack on your heel for 20 minutes several times a day helps reduce in inflammation. Place a thin towel between the ice and your heel; do not apply ice directly to skin. • Shoe modi cations. Wearing supportive shoes that have good arch support and a slightly raised heel reduces stress on the plantar fascia. • Medications. Oral nonsteroidal anti-in ammatory drugs (NSAIDs), such as ibuprofen, may be recommended to reduce pain and in ammation. • Orthotic devices. Custom orthotic devices that t into your shoe help correct the underlying structural abnormalities causing the plantar fasciitis. • Injection therapy. In some cases, corticosteroid injections are used to help reduce the in ammation and relieve pain. • Night splint. Wearing a night splint allows you to maintain an extended stretch of the plantar fascia while sleeping. is may help reduce the morning pain experienced by some patients. • Physical therapy. Exercises and other physical therapy measures may be used to help provide relief.